I've been thinking a bit about tasting notes lately. When I first started writing this blog I tried to stay away from them; I find they can be dry, repetitive and not really much fun to read. A few of the round up posts I wrote came pretty close, but I tried to keep it observation and opinion based rather than full on tasting note. Increasingly I find myself searching out tasting notes for the beers I’m drinking. It’s useful to be able to calibrate your palate against other people. Things you might otherwise have missed can be pointed out, flavours you can’t quite define can be defined and technical reasons behind a specific character in the beer can be made obvious. For me it’s a vital part of growing as a beer drinker, it’s a great way to learn more about the beer you’re drinking and it allows you to better appreciate the subsequent beers you drink. Whilst there may be no substitute for sitting around and sharing a beer with fellow beer lovers; tasting notes on the web do provide a good alternative. Some of the better resources are referenced at the bottom of this blog entry(1). Quality of content is something they all have in common, but the differences in the way that content is delivered are wide and numerous. Zak Avery accompanies all of his tasting notes with a youtube video, allowing him to be more conversational and emotive with his message. Rob at Hopzine.com has great consistency between beers by providing a structured breakdown of appearance, aroma, taste and overall experience. And Mark Dredge brings a sense of real-time to his tasting notes by blogging them in an As-Live format. That point around consistency is key for me. I’d like to see a standardised platform on which beers can be rated and reviewed, allowing for the standout differences between one review and the next to be solely about the differences in the beer, not about the review style. A platform that provokes the reviewer into thinking about each part of the beer and allows them to be assessed in turn, limiting the opportunity for short, non-descriptive, inaccurate tasting notes. Mark Dredge writes (here) about the tasting chart that Badger use on the reverse of all their bottles. Breaking down the beer into bitter, sweet, hoppy, malty and fruity; they introduce the concepts of malt and hops as beer ingredients and rate the intensity of each to give the drinker an idea what to expect. Hand in hand with the taste chart is Cyclops; an independent methodology that aims to demystify beer and make it accessible to the average drinker. Cyclops provides single word tasting notes for appearance, aroma and taste and then rates sweetness and bitterness out of five. Taking inspiration from these I’ve started to put together a tasting note template for myself. Something to use whenever I review a beer, something that will guide me through the tasting of a beer in a structured and consistent way, allowing me to capture my thoughts for future reference and for anyone that happens to read the review. My approach breaks a beer down into ten categories. Four of these are key ingredients that make beer: yeast, hops, malt and special grains. The remaining six are generic flavours which apply to most beers. Collectively these ten descriptors will allow an overall profile of almost any beer style to be defined. Each category will be given a rating out of 5 with the results being plotted over a radar chart. The categories will then be used as a guide to write more detailed tasting notes, with justification for the score given also being included. I hope that this will allow me to write succinct, consistent and comparable tasting notes over a long period of time. They will be accessible to the new beer drinker, interesting to the beer geek and useful as reference point all at the same time. I plan to develop this over time, so it would be interesting to hear thoughts and opinions. I also want to make it ‘open source’ and available to anyone that wants to use it, so I’ve uploaded the template here and included instructions. Feel free to have a look. Good post, I think we used similar "tasting wheels" to yours when I did the Brewlab start up course. Will have to try and dig them out. Writing good tasting notes is a skill I'm still developing. Personally I find the cyclops approach too simple. The wheels that CAMRA tasting panels and Brewlab use are too complex for someone learning but can still miss subtle but important flavours and aromas. In summary I don't think there is any right or wrong approach and I like this simplified flavour wheel as an addition to the toolbox. As a total beginner, when trying to write descriptions of my own and others' beers, I really like the bjcp checklist and scoresheets. They are consistent, they are precise, and most of all they are suggestive. There is no chance of sitting there having nothing to say. They ask you questions. Is there any x.y.z flavour here? They give a list of characteristics/faults, as a prompt. For a beginner, this is an invaluable resource. For trying to put that description out to others, your template looks great. Much more to it than the cyclops. If it was me though, I'd swap 'hop' with 'special grain'. That way, the categories are grouped together in such a way that the shape would tend towards one area or another, to give a general feel. Also, it's a 'taste web'! Nice! I have been against writing down tasting notes (pen and paper). I do blog in "real-time" as I am drinking a beer. It allows me for instant judgment and evaluation, as well as continued evaluation throughout the beer as it warms. I too read reviews and tasting notes online, hoping to gain insight and a better vocabulary to describe the tastes. I guess it depends on what you're trying to communicate. For me, taste and smell are emotive senses that trigger more in my brain than ticks in a box or points on a wheel. If you drive cars, or ride motorbikes, an analogy might be that you can't get a feel for what a vehicle is like purely by looking at a stats sheet for it, and you can't communicate what it's like by referring to the same sensations every time. Indifferent as I am to the charms of Jermey Clarkson, when I saw him describe a Chrysler/Dodge Crossfire as 'looking like a dog that was doing a number two', I was struck that not only was he right, but that he was communicating something about the car beyond just describing its shape. Really interesting post. I agree with Zak and think that tasting notes work better when they are a moving target; unless you sit in exactly the same room, distraction-free, in exactly the same mood, whenever you taste a beer, then the time and place and mood of the drinker are important. However, it is also important to have a 'template' like this to base the basic flavours and tastes around to get a consistency. Plus it's a great visual representation of taste. One comment would be that differentiating taste and aroma could be important - sometimes a beer smells amazingly hoppy but doesn't taste that way, and vice versa. Could there be a separate chart for aroma and maybe appearance? And mouthfeel is very important. Also, what is 'other'? How many drinkers will understand 'special grain'? How important is it to taste yeast and how style-dependant is it? Beer is more than the sum of its parts. An over-analytical approach kills off the joy of beer. Understand the constituents in beer, for sure. But for me there's something beyond the numbers that makes beer what it is. Who you drank it with, where you were, when you drank it, why you loved/hated it. It's context that can make an average beer taste world-class and a world-class beer taste average. The more I think about it, and I'm trying really hard to not think about beer at the mo, the more I begin to care less about style and such like. I'm beginning to side with Kierkegaard - "Once you label me you negate me". I’ve seen tasting wheels (or radars) used before, but not by brewlabs. It would be interesting to see how they break theirs down. The BJCP checklist is great, thanks for the reminder Stig. That is definitely something I will add as an extra tab, I find it can act as a prompt both to remind you of flavours you might not be thinking of and to help when you can’t quite nail down something you’re tasting. I hadn’t given any real thought to the order in which the radar/web is laid out; I’ll have a look at that too! The target audience of the template is more someone with “experience” tasting beer than the complete beginner. I know this narrows the target audience somewhat, but the intention is to allow for a link between ingredient and flavour to be made in the text description boxes. This will go someway to making the overall tasting note accessible to the novice. Zak / Mark / Scoop: Good points. I agree entirely that beer is more than just marks out of ten or points on a wheel. Environment, mood and a hundred other external factors will all play a part in your enjoyment of a beer; I completely agree with you. Similarly, physical factors like temperature, glassware and ambient aroma will all impact your ability to detect things in a beer (a subject for another blog). Despite this however, there are flavours and tastes in a beer that will always be there, regardless of mood or anything else. Drink a stout at any point and you should taste roast – outdoors, indoors, down in the dumps or on top of the world; it should always be there. As your [Mark / Scoop] comments point out, the idea behind this template is to allow for those basic flavours, the definition of the beer if you like, to be put down in a consistent way; hopefully aiding a growth in the appreciation of beer flavour and the ingredients which make it. Aroma is something I toyed with the idea of including. I couldn’t really come up with a way to do it and still keep things simple and easy to read. A second chart is a good idea, maybe mirroring the first one to allow for a consistent approach. The “other” category is something I didn’t mention in the blog but referred to within the instructions on the template. I agree that it looks odd at first! The thought process behind it being that it would be impossible to include every possible beer flavour on the wheel, but that some beers are largely defined by flavours not covered by the categories I’ve laid out. 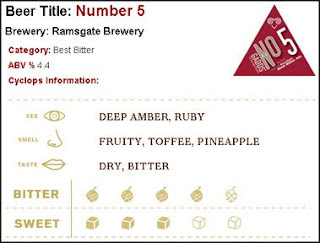 The “other” category can be named and used at the taster’s discretion for these sorts of beers. A good example being Kriek … in which case you might change “other” to “cherry”. Well thank you for the high acclaim. For me I kind of fell into doing tasting notes/reviews. I was rather new to taking an analytical approach to drinking beer so it was a starting point. It has always been about a personal journey, discovering new beers, beginning to understand styles and reporting my experience. Sometimes it can become repetitive to write let alone read about yet another IPA or Imperial stout. But I usually write about beers that I’ve got some person interest in or one that I think people will be interested in reading about. I used to read Maximum Rock ‘N Roll and Punk Planet and they were my barometer for records to buy. If I read that a new record buy Cutless Supreme was reminiscent of Jawbreaker circa “24 Hour Revenge Theory” I’d be inclined to check that record out. Same goes for beer, if a British brewery had brewed a beer that tasted just like Bear Republic Racer 5 and be clambering over piles of dead bodies to get my grubby mitts on some. The radar charts remind me of the new-fangled Pro Evo graphs they used to compare players. They can be enlightening, once you've got your head around them, and it could be interesting to see how different styles/beers start to look like each other (and how they differ). Very interesting topic here in your site. Keep on posting this kind of topics. Very useful indeed.